My next project is my two youngest daughter’s shared bedroom. My youngest is nearly three, so she will be transitioning from a crib to a big girl bed and my four year old is going from a toddler bed to a regular twin too. 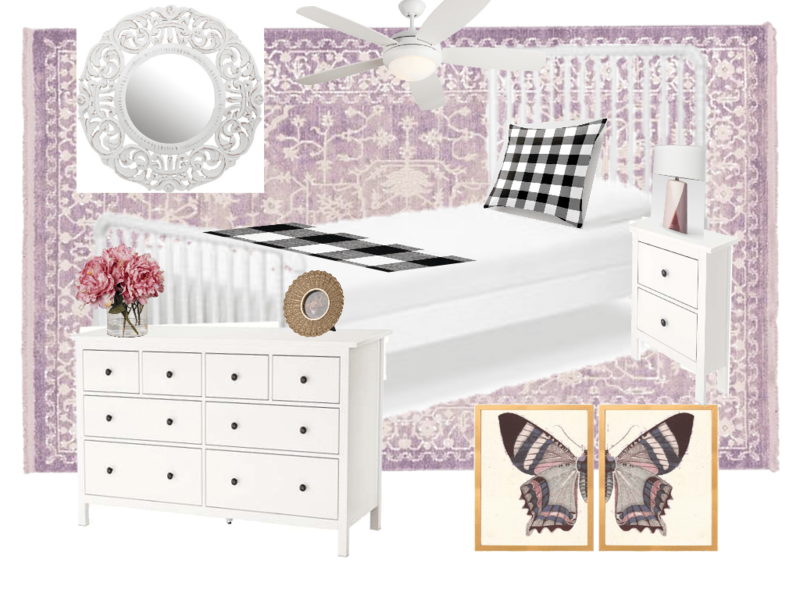 My first design base is a picture advertising the bedding, but I added the black and white check. The wall decor will not be same, but you get an idea. The bed frames will be white and made by my husband out of wood or metal. The next design I created has more purple and the items are more handpicked. Pick a color scheme and then start deciding what you already have and what you need to get. The bedding, rug and wall colors are going to be the dominant colors in the room so make sure they all look good together. The pops of accent colors can be added in the art, accessories and throw pillows. Notice that the popular girls rooms have wallpaper on one wall that have colors coordinated throughout the room too. You can start with a wallpaper that you love and then build the room around the colors present. 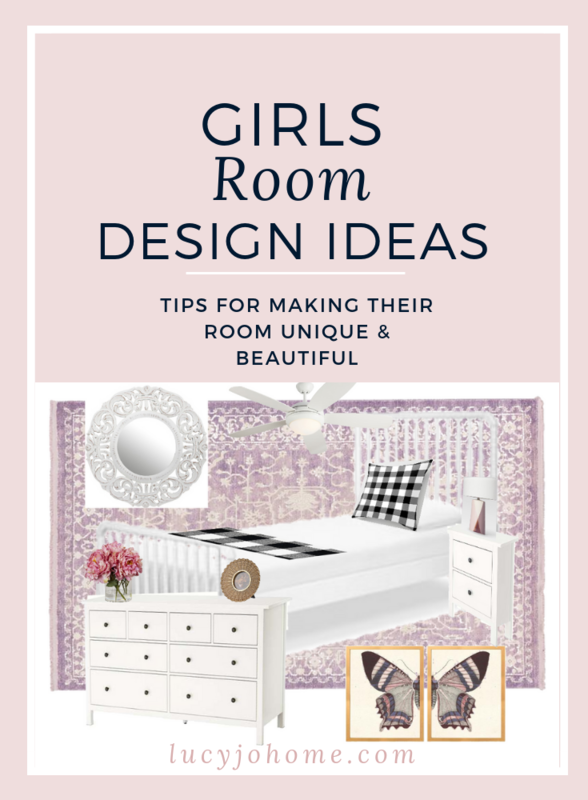 At the bottom of the post I share tips on designing your child’s room. The rest of these images are favorite shared girls rooms. If you click on the image you will be directed to the designer’s website. 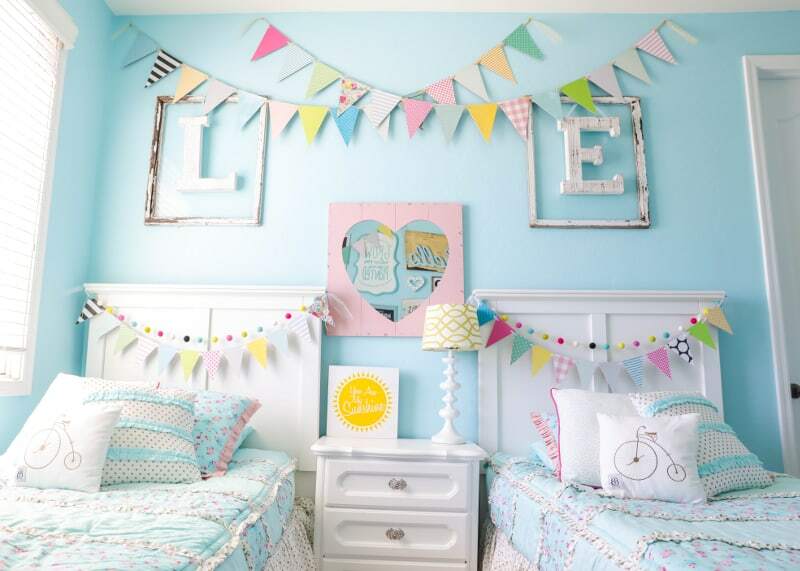 Here are also a few tips on how to work with your kids about the room design too. Don’t disregard the very people who will be living in the space. 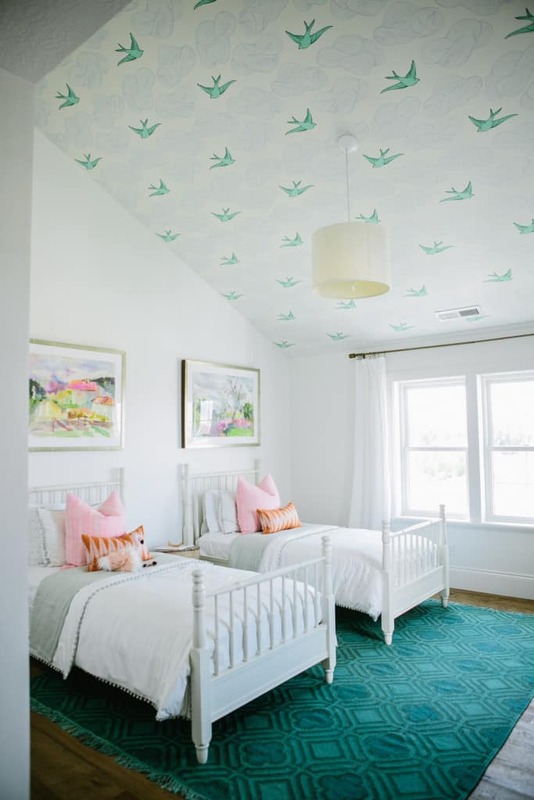 You don’t have to hand over design decisions to a four year old, but you can give them some pre-selected options for the room that are not going to interfere with the overall look of the room. Think about their personalities and what would be fitting for their space. Try to customize the space so it is something they love as much as you do. For example, my girls love butterflies, ballet and flowers. If your girls are into a particular subject or activity, try to incorporate it into the design. Let them see your design process and get them excited about the changes coming. If you can include them in an art project or even a DIY project for the room, they will feel more ownership in their room. Try to think ahead a little bit. It is hard for me to picture my two year old as an eight year old, but if we are still in this house when the time comes, I want make purchases that she can grow into. I suspect she will want to refresh her room when she becomes as a teenager, but I am not interested in re-doing her room year after year until then. A great way to buy things that will stay relevant over time is to choose neutral colors for major items like bed, headboard, and bedding. Art, wallpaper, throw pillows and even the rug can be switched out to make a new look later on. Don’t overrun your child’s room with toys and books. Their bedroom is a place that they should be able to rest in, so try to minimize distractions. Having a few treasured items available to them will be better than everything they own scattered around the room often. 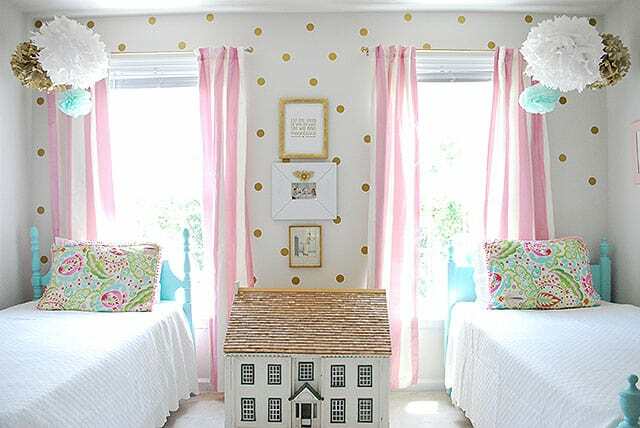 A shared girls bedroom can be a really fun design adventure. I hope that you can create a space that your children love and can use easily. I look forward to sharing our design process with you.